Words and what not: #Myanmar #Wiktionary reaches 100,000 words! I started contributing to Wiktionary at the end of last year. It was difficult to maintain a nearly inactive Wiktionary with a couple of regular members. So I decided to make the Wiktionary usable to certain extents first while I tried to recruit new contributors. I collected opensourced dictionary data online such as Ornagai, electrical engineering dictionary porject and Sealang Burmese dictionary. Online community generated data such as Ornagai has a lot of spelling mistakes in it and the format and definitions are inconsistent which need to be improved greatly. Then Myanmar NLP kindly provided me with the Myanmar lexicon database. Pywikipediabot is a very handy and useful application. I used to run it for fixing minor encoding mistakes in Burmese. Now I used it to upload dictionary data. I spent the Myanmar new year (13th-17th April) formatting the data to Wiki markup. Now Myanmar Wiktionary is available in two languages as English-Burmese and Burmese-Burmese. While bot was uploading data, we tried to improve the homepage design and to add more words which were not in the collected dictionary data. Today, Myanmar Wiktionary reaches 100,000 words. It might be confusing that why there are not a lot of Burmese Wikipedians or Wiktionarians. 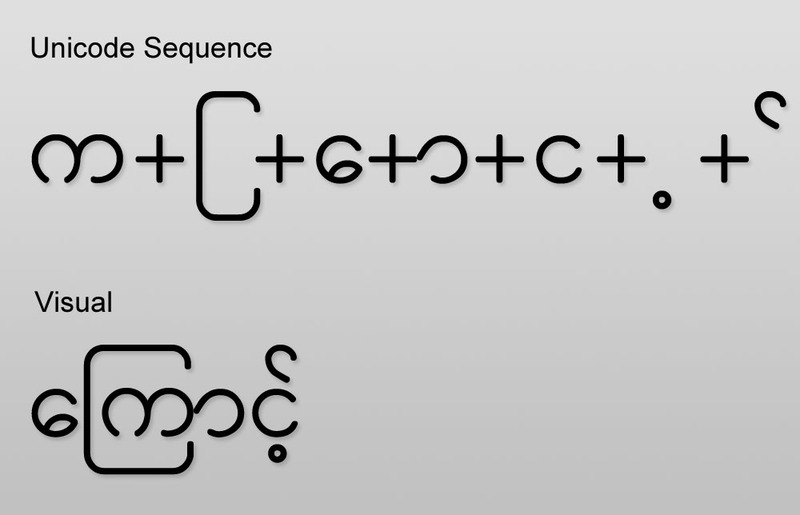 It was a complex drama that there were several pseudo Unicode fonts (they use Unicode codepoints for Burmese, but never follow the codepoints exactly or the encoding order) when standard Unicode fonts were still in development, and one of the pseudo Unicode font named Zawgyi became popular. Unicode fonts are used in Government offices and international projects such as Wikipedia. Yet a normal Burmese online citizen would only use Zawgyi font. We, the Unicode activists, tried to make awareness of Unicode standard and got some achievements as popular IT forums such as MyanmarITPros, Mystery Zillion and Mmitd between 2011 English new year and Burmese new year. Before major OS vendors such as Apple and Microsoft support Burmese language in OSX and Windows, there should be solution for usability of Wikimedia projects for OS unsupported languages. Even after texts are readable, editing texts in local languages needs special keyboard inputs. Languages such as Burmese needs keyboards with reordering capability. People usually don't have keyboard installed in their computer or mobile devices. There is a project called Narayam which is a build-in keyboard plugin for MediaWiki and I helped writing Myanmar Unicode keyboard for it. There is also a Burmese local project called Keymagic and one of it's effort was web keyboard. I hope with the help of them, editing Wikipedia even in local language would be possible. Hi, I came across your post only now. Do you still have the original word lists English-Myanmar and would it be possible to share it (if the license allows it - crediting is of course possible)?